Q :: How do I know if I have a tank on my property? A :: All tanks must have a fill and vent pipe. Unexplained metal piping found in the lawn or garden is usually an indication. Capped pipes coming in the basement furnace walls are another sign. Many people are unaware of underground tanks until a home inspector discovers it just before selling their home. Q. Am I required to remove my tank? A :: Single family homes and duplexes are exempt from federal and Illinois State underground storage tank laws. A few local communities have laws requiring tanks be removed when they are not being used. Q :: If I am not required by law to remove my tank why should I? A :: The tank becomes a liability when it is time to sell your home. 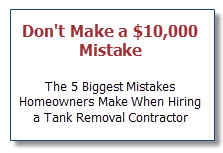 Most real estate brokers recommend that the tank be removed. In addition, although most tanks do not cause a major environmental problem there are a small number that do. In those cases the cost of the removal project increases greatly. Removing them sooner is more prudent than later. Q :: What if my tank has leaked? A :: Most residential tanks develop small holes. These leaks are minimal and localized and do not require expensive remediation. A petroleum odor in the basement or dead foliage near the tank may indicate a larger problem.